The Yulong River, with its dramatic karst landscape, silky water, and ancient bridges, is a great place for bamboo rafting. Known as &apos;the Little Li River&apos;, it’s a tributary of the Li. The essence of the Yulong River is between Yulong Bridge and Gongnong Bridge, about 13 kilometers (8 miles). Delight in the idyllic scenes of simple rural life, and a few small villages with old buildings set among hillside greenery. 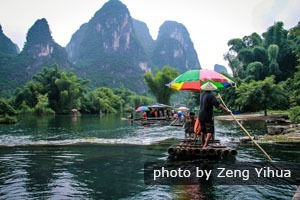 It is popular to take a bamboo raft on the Yulong River. The most popular way to enjoy the scenery of the Yulong River is to take a bamboo raft. 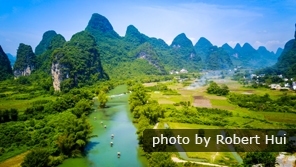 Even if you have experienced a cruise or rafting on the Li River, you should not miss this smaller, quainter river. There are two raft routes: 40–50 minutes and 1½ hours. For the shorter rafting, we can arrange your raft route for boarding at the closest pier to your hotel. The raft company doesn’t allow people over 70 or under 7 years old to take a bamboo raft. 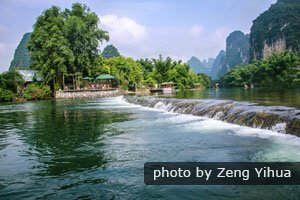 But don’t worry: we can arrange other ways for you or small kids to explore the Yulong River countryside apart from bamboo rafting. The rafts on the Li River are driven by noisy motors. 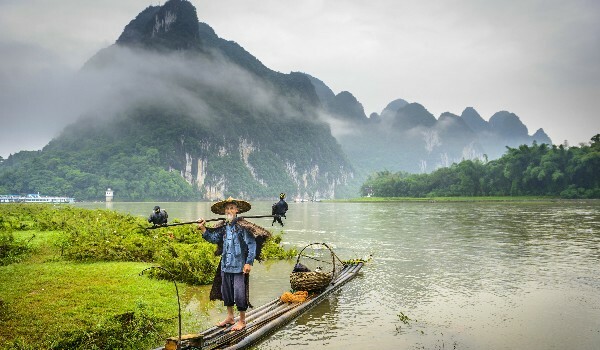 Bamboo rafts on the Yulong River are punted slowly by a man with a pole, for an altogether quieter experience. The rafts just float down the river and can pause in any place you want. The mountains along the Yulong River may be not as impressive as the ones along the Li River, but the river is much quieter and more rustic. You can sit back and soak up the idyllic scenery in an air of serenity. 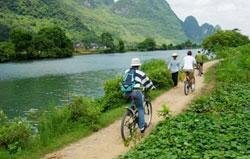 The Yulong River is part of a classic cycling route in Yangshuo. 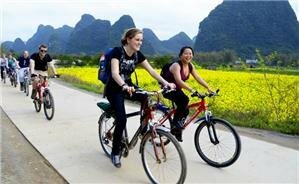 In a 2–4-hour biking tour, you will be rewarded by beautiful scenery combining karst hills, green water, and ancient villages. 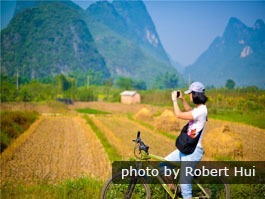 See more on Yangshuo Cycling. Our tour are flexible . If you are not fond of cycling, we can arrange private air-conditioned transport for you, which can stop by the major attractions for you to get out and see the scenery, or anywhere you want. The most in-touch-with-nature way to appreciate the beauty of the Yulong River is hiking. The small countryside trails will take you through rice paddies, lush green mountain scenery, and fruit orchards. The most popular section is from Yulong Bridge to Jiuxian Pier, about 6 kilometers (4 miles). It takes about 2 hours. See more on Yulong River Hiking. The high season for visiting the Yulong River is from April to October when the weather is mostly sunny and warm and suitable for outdoor activities. The best time is probably late summer for pleasant warmth and less rain, though the mists and fresh growth in spring also have their charm. Rain increases to torrential downpours on some days up until the beginning of June, and decreases from then on. The occasional thunder showers in August usually dry up in an hour or so. On some days, particularly in May and June the Yulong may be flowing too fast and high for rafting to be as enjoyable or safe. During Chinese public holidays, such as Labor Day week (May 1 to 3) and National Day week (October 1 to 7), Yangshuo is always crowded with Chinese people. 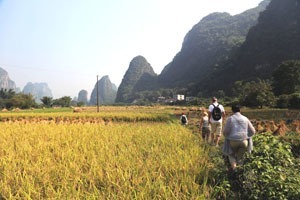 School holidays in July and August are also a crowded time in Yangshuo. Our guides use their expert knowledge to avoid the crowds and find routes with fewer travelers. We arrange rafting, cycling etc. for times when the huge crowds have left or are yet to arrive, so that you are not stuck in traffic or lines. 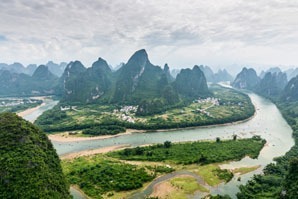 No visit to Guilin is complete if you don&apos;t visit the Li River. 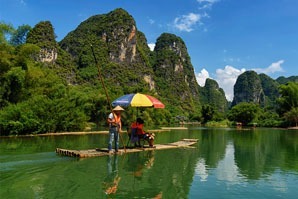 Similarly, no visit to Yangshuo is complete if you don’t visit the Yulong River. 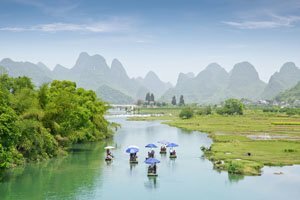 Here are our most popular itineraries including the Yulong River for your reference. These sample tours and can be modified according to your interests and requirements. For something very different, contact us and we will design a tour uniquely for you.